“Transparency is perhaps the most potent tool in the fight against corruption,” said Associate Professor Karthik Ramanna, launching into a presentation about a fearless publisher of exposés in Russia and an Indian website that crowdsources examples of government officials seeking bribes. His talk was part of a series of live Web chats, hosted by the South Asia Institute and funded by the Pakistan Higher Education Commission. One recent morning, Karthik Ramanna, an associate professor of business administration at Harvard Business School (HBS), sat down in a virtually empty Harvard conference room and prepared to explain different forms of government corruption and how to combat them. But he was not teaching his usual M.B.A. students. Rather, his words — specifically, a presentation of HBS three case studies on anti-corruption efforts in China, Russia, and India — were being broadcast live to students, academics, and activists at 13 universities in Pakistan, Bangladesh, and Sri Lanka. Ramanna, an authority on corporate accountability, was sharing his knowledge with the eager audience of budding social entrepreneurs, who had gathered in classrooms around the world (it was evening, by their time) to hear how his examples might prove useful in their homelands. Corruption is a problem in countries, Ramanna said over the live feed, but that doesn’t mean it can’t be solved by clever, dogged individuals. “Transparency is perhaps the most potent tool in the fight against corruption,” he said, as he launched into a presentation about a fearless publisher of exposés in Russia and an Indian website that crowdsources examples of government officials seeking bribes. His talk was part of a series of live Web chats, hosted by the South Asia Institute and made possible by the Pakistan Higher Education Commission’s Virtual Education Project, that aims to bring together Harvard experts and social entrepreneurs in South Asia. The live video chats are the latest tech-savvy solution to the question of how Harvard can share its insights on education, health, good governance, and a host of other social issues with civic-minded entrepreneurs around the globe. 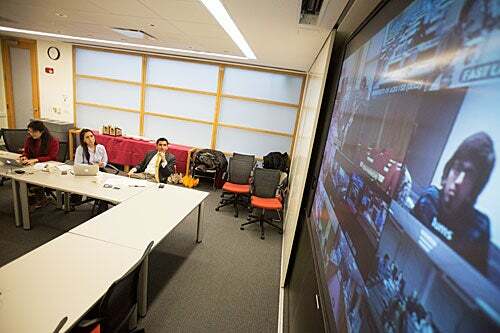 The video conferences are the latest project of the Pakistan Innovation Network, a social enterprise started by graduate students Mariam Chughtai, a doctoral candidate at Harvard Graduate School of Education (HGSE), and Erum Sattar, a doctoral candidate at Harvard Law School (HLS). In addition to Ramanna’s class on Feb. 27, the series also has featured Fernando Reimers, Ford Foundation Professor of International Education, and Tarun Khanna, HBS’s Jorge Paulo Lemann Professor, and Sattar and Chughtai are planning six more conferences for the 2013-2014 academic year. The startup, which receives support from the South Asia Institute, recently acquired space in the Harvard Innovation Lab to continue its work on fostering social entrepreneurship in Pakistan and the surrounding region. Students Erum Sattar (from left) and Mariam Chughtai (center), and Karthik Ramanna, associate professor of business administration at Harvard Business School, talk via webcast with participants from Bangladesh, Pakistan, and Sri Lanka. Sattar and Chughtai, who are both from Pakistan, hope to capitalize on a growing interest in entrepreneurship in the region, where neither civil servants nor business leaders are necessarily taught to think about how to solve broad societal problems. “In India or Pakistan, people go to business school to work for Citibank or Coca-Cola,” Sattar said. “Not that there’s anything wrong with that, but they’re not trained to solve the problems and work on finding solutions to the most pressing social concerns. People are seeing that problems are going to have to be solved innovatively. Sattar and Chughtai acknowledge that few Harvard professors can find time to travel to — or even have much expertise concerning — Pakistan, but they hope that virtually connecting students and activists in the region with Harvard academics can lead to a fruitful exchange of ideas. That difference in worldviews was on display during Ramanna’s video chat. After he presented the case studies, questions poured in through Twitter and the live feeds in classrooms across the globe. And Ramanna’s students for the day were not afraid to push back. “None of your examples would work in our country,” said one leading activist from Sri Lanka. While the country has no dearth of “bravado” when it comes to calling out corruption, he added, “Naming and shaming makes no difference in our country.” There are also structural impediments to unearthing corruption, he added. To start a petition to Parliament, Parliament must first sign off on the content of the petition. When a questioner in Karachi, Pakistan, asked about the ability of open-source models, such as the website WikiLeaks, to achieve “radical transparency” in government, Ramanna urged caution. “Instances of misuse of transparency have ironically received more coverage in some cases than corruption itself,” he said, noting the notorious legal and media backlash against WikiLeaks. In Sattar’s view, the morning’s session was a perfect example of how social media can enliven conversations about deep, systemic problems like corruption that will require years of slow, determined work to solve.